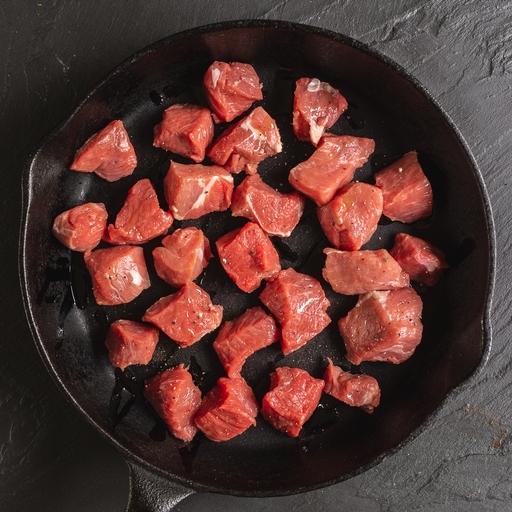 Fresh organic lamb, carefully diced in the Riverford butchery to just the right size for most classic lamb recipes. It makes wonderfully succulent kebabs, rich lamb curries and fragrant tagines. No need to give it a very long cook time – it's naturally tender. Serves 3-4. A leaner cut from the leg. Can be cooked quickly in a frying pan or threaded onto kebab skewers for the grill or BBQ; it will take about 10-12 mins on a moderate heat. It is perfect for relatively quick curries, casseroles or stews too; brown the meat well on all sides before adding to your dish of choice and cooking gently for an hour at the very least, or until tender.